While the digital world offers many replacements for items like books, receipts, calendars and other clutter-creating paper goods, sometimes the digital versions can leave us longing for the tactility of yesterday (well not the receipts). If you’re a scribbler or doodler, the Betabook might offer a nice middle ground between lightweight digitalism and tactile goodness. The Betabook is essentially a portable dry-erase board designed to be used in concert with your mobile device. Betabook inventor Jay Cousins found that of the many notebooks he filled out, there were only a few items worth saving. Rather than having a complete paper archive, giving equal real estate to good and not-so-good ideas (alpha and beta, if you will), he wanted to make a notebook that would enable you to parse out the good ideas and clear out the others. You can take a snapshot with your phone of the ephemeral contents of the Betabook. If it’s a decent idea, you have a volume-free digital archive with the pic. Even if it’s a lousy idea, sorting through digital files is an easier task that rifling through countless paper notebooks. Cousins sent me a Betabook to try out for a bit. It was the smaller of the two sizes (8.3″ x 11.7″), which is roughly the size of a Molskine notebook, but far lighter. Admittedly, I’m not a prolific scribbler or doodler, so I wasn’t necessarily the ideal tester. I mainly use notebooks for, well, notes; the marker included wasn’t necessarily ideal for writing text (I used to be on the debate team, so my script runs on the small side). However the Betabook became a staple in my bag of tricks for entertaining my 2.5 year old son. 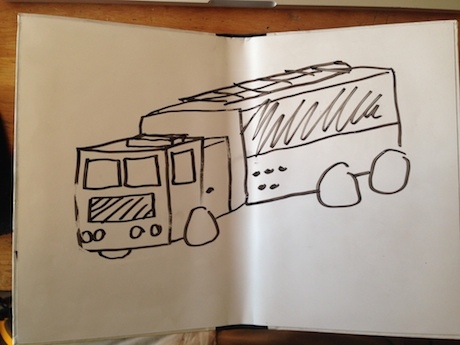 At home as well as on several long train rides, we drew countless fire trucks. The whiteboard was easily wiped completely clean, making various drawings of fire trucks easy to replicate. I liked the fact that I wasn’t using a bunch of paper for drawings whose novelty wouldn’t last as long as an airplane contrail. In fact, Cousins estimates a Betabook, if it replaced 1000 sheets of paper, would spare ⅛ of a tree per year. If you want to get a Betabook, visit their Kickstarter campaign page. They’ve already received $60K of their $15K goal–a decent index for a good idea. 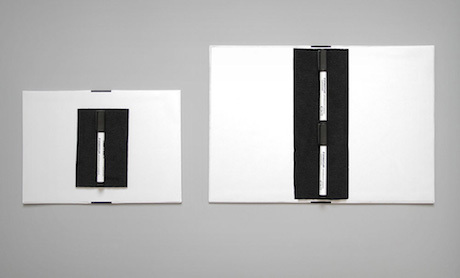 A $30 pledge will get you their basic book, pen and wipe cloth.